Edward Christopher Sheeran, MBE (born 17 February 1991) is an English singer-songwriter, guitarist and record producer. He was born in Halifax, West Yorkshire, and raised in Framlingham, Suffolk. He attended the Academy of Contemporary Music in Guildford, Surrey, as an undergraduate from the age of 18 in 2009. In early 2011, Sheeran independently released the extended play, No. 5 Collaborations Project. After signing with Asylum Records, his debut album, + (read as "plus"), was released on 9 September 2011 and has since been certified seven-times platinum in the UK. The album contains the single "The A Team", which earned him the Ivor Novello Award for Best Song Musically and Lyrically. In 2012, Sheeran won the Brit Awards for Best British Male Solo Artist and British Breakthrough Act. 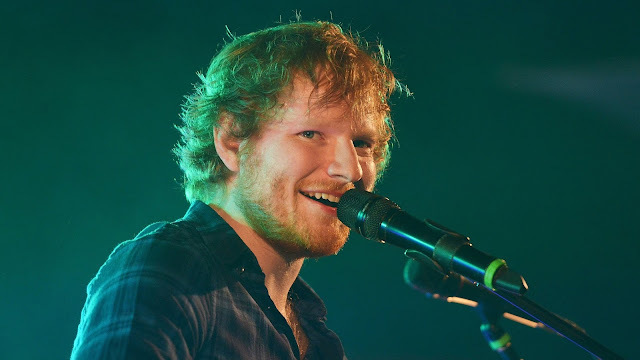 Sheeran's popularity abroad began in 2012. In the US, he made a guest appearance on Taylor Swift's fourth studio album, Red. "The A Team" was nominated for Song of the Year at the 2013 Grammy Awards, where he performed the song with Elton John. He spent much of 2013 opening for Swift's The Red Tour in North America dates.His second studio album, x (read as "multiply"), was released on 23 June 2014. It peaked at number one in the UK and the US. In 2015, x won the Brit Award for Album of the Year, and he received the Ivor Novello Award for Songwriter of the Year. His single from x, "Thinking Out Loud", earned him two Grammy Awards at the 2016 ceremony: Song of the Year and Best Pop Solo Performance.